1. In a soup pot, heat the oil. 2. Add onion and garlic and saute for abot 5 minutes. 3. Add water, wild rice and seasonings and bring to a simmer. 4. Over and simmer for 20 minutes, over medium heat, stirring once or twice. 5. Add sweet potatoes and corn, turn down heat slightly and cook for another 25 minutes, stirring occasionally. 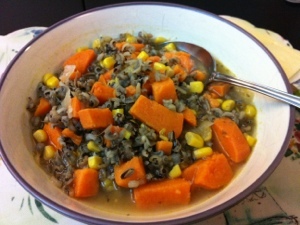 This entry was posted in A Peek Into My Kitchen, meatless monday and tagged allergy friendly, dinner, easy recipes, main course soups, meatless monday, soup, sweet potato, vegan soups, vegetarian soups, wild rice and corn chowder by jessica. Bookmark the permalink.